The Oshawa Generals took on the Sault Ste. Marie Greyhounds at home to cap off a three game weekend in which their offense exploded. To begin the game, the Gens and Greyhounds traded chances at both ends of the ice, with both coming close to netting the first goal. However, it was in the dying seconds of the period that Serron Noel put one past Greyhounds goalie Matthew Villalta to give Oshawa a 1-0 lead at the end of the first. Heading into the second period the Gens continued their strong defensive play as goalie Kyle Keyser stood tall in net. After killing off a slashing penalty, Brandon Saigeon was able to flip the puck past the defense and hit the back of the Greyhounds’ net for his 33rd of the season and to give the Gens a 2-0 lead. However, momentum would swing towards Sault Ste. Marie as Mac Hollowell scored two goals to tie the game, leaving the score 2-2 at the end of the period. While both teams would trade quality chances up and down the ice, the third period would remain scoreless, and they would have to go to overtime. The Gens weren’t able to take a shot before Hollowell completed the hat trick for the Greyhounds to hand Oshawa the 3-2 overtime loss. Both teams played an even game as the Gens outshot the Greyhounds in regulation 34-33, while Sault Ste. Marie would add three more in overtime. Keyser was named the first star of the game after stopping 33 of 36 shots, and Saigeon was the third star of the game after getting a goal and an assist. In earlier action, the Gens took on the rival Peterborough Petes, where they hoped to recover from a weekend where they lost all three games. 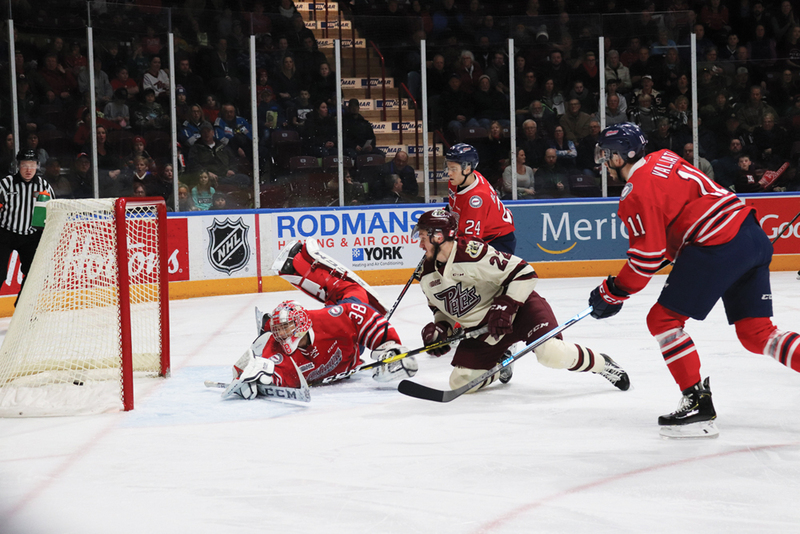 Playing the first game of a home-and-home against the Petes, the Gens looked to open the scoring early as Tyler Tullio passed one from the boards to Mitchell Brewer, who put it past Petes goalie Tye Austin to give the Gens the lead. However, less than a minute later Chad Denault scored for the Petes to tie the game. While on the penalty kill, Kyle MacLean wristed a shot past Austin to give the Gens a shorthanded goal and once again the lead. In response however, Liam Kirk and Smyon Der-Arguchintsev both scored for the Petes to make it 3-2 at the end of the first period. Heading into the second the Gens were quick to get back on the board as Tyler Tullio scored his 11th of the season, tying the game. Oshawa wasn’t done there as Dylan Robinson scored his second of the season less than a minute later after he put the rebound past Austin. Continuing the offensive push, Nando Eggenberger then sniped a breakaway shot into the Petes net to make the lead 5-3. However, the Petes were able to answer as Adam Timleck put one past Keyser, cutting the Gens lead down to one. Only a few minutes later, Danil Antropov snapped one into the back of the Petes’ net for his 12th of the season. The Gens weren’t done there, as Saigeon was able to put a rocket in the top corner to give the Gens a 7-4 lead at the end of the second. For the first half of the third period, only one goal was scored as Allan McShane took a puck from in front of the net and put it past Austin to add one more to the Gens lead. However, in the second half of the period the pucks were finding holes as the Petes added two more shorthanded goals when Zach Gallant and Nick Robertson both put one past Keyser to make it 8-6. In the end that would be the last of the Petes offense, as Brett Neumann added one more, and was then followed by Anthony Salinitri to make the lead 10-6. They weren’t done there either, as Neumann and McShane would both add their second of the game, making the final score 12-6 in favour of the Gens. Tullio was named the first star of the game as he had a goal and three assists, Saigeon was the second star with a goal and three assists, and Eggenberger was the third star with a goal and two assists. Not only did the Gens outshoot the Petes 46-37, but they also went 5-for-8 on the powerplay. The Gens then moved on to Peterborough to complete the home-and-home while also looking to maintain their momentum, as Oshawa was looking to continue their offensive onslaught from the previous game. Things didn’t quite start the Gens way as just over a minute into the game, Kirk opened the scoring for the Petes. The Gens responded with less than five minutes left in the period however, as Saigeon sniped one past Petes goalie Hunter Jones to tie the game at the end of the first. Looking to keep it going, McShane took possession of the puck right in front of Jones, and was able to wrist it by him to give the Gens the lead. Antropov then added to Oshawa’s lead, as he tipped one in off the one-timer from Nico Gross, making it 3-1 for Oshawa. Peterborough responded however, cutting the lead down to one as Christopher Paquette scored. The Gens didn’t take that lying down however, as Cole Resnick bounced the rebound past Jones to give the Gens a 4-2 lead at the end of the second. Going into the third, Paquette scored again for the Petes, cutting the lead down to one once more. However, Nicolas Mattinen was able to add one more from the point, the 16th of the season for the defenseman, and Saigeon added one on the empty netter to give the Gens a 6-3 victory over the Petes. Antropov was named the first star of the game as he scored a goal and had an assist, while Keyser was the third star of the game after stopping 29 of 32 shots. Oshawa was outshot 32-28, and went 1-four-4 on the powerplay. The Gens will now move on to take on the Hamilton Bulldogs on Feb. 7 on the road, followed by another game on the road against the Erie Otters on Feb. 8, and will return home on Feb. 10 to take on the Barrie Colts at 6:05 p.m.